If you've been thinking about refinancing the hacienda and taking advantage of these new low rates, why not toss in a little firewood for the winters ahead. Yeah, this one's real, and one of the cleanest 57's I've seen listed. 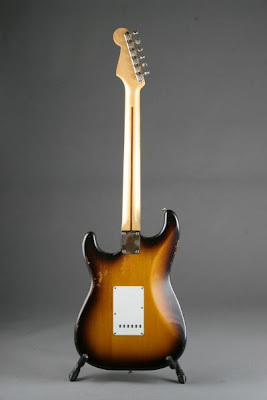 Seller is railroadguitars - an eBay Store with lots of hi-end vintage inventory. Serious firewood over there kids! 100% original, including all the screws, even that super-white pickguard, and EVEN the solder joints. 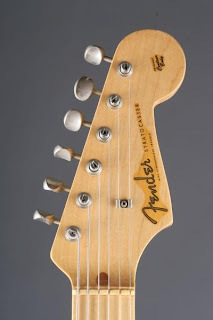 Yes, they really said the solder joints are original. 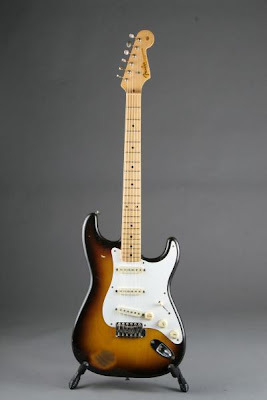 Note: Not many people recall the Solder Stalker of 1962, who went around re-doing the solder joints on '57 Strats. Apparently, he didn't get near this one. The strings aren't original though, which is kinda disappointing. But at least they don't say, "It plays like butter!" -- a lot of us out here really hate that line!